While I never would have used the particular word, bitterness was a part of the initial ball of emotions surrounding the loss of Avery and Sophie. It wasn’t easily separated from the hurt, anger, and disappointment … and at the time I think I would have denied its presence, but looking back, I know it was there. Several experiences recently have highlighted for me just how present bitterness can be after a loss … but have also highlighted just how necessary it is to let it go in order to continue the healing process. It can be hard, because bitterness (like anger) is easier to wield than hurt and pain, but eventually it needs to be released. Because without release, it just grows until everything good about your baby/babies is completely eclipsed by it. And I know that is the last thing that a baby-loss mama wants – to have her child only associated with the bitterness she holds. I wish I had a tidy wrap up to this post, some profound solution to dealing with the bitterness that is bound to at least rear its head at some point. But I don’t … just rambling thoughts and observations today. Hard to believe that 3 years have passed. Remembering through the night and into the morning, it seems hard to believe that the time has disappeared so fast. Happy Birthday my sweet baby girls. How I wish we could help you celebrate your 3rd birthday on earth instead of your third in heaven. We still miss you every day. Love Momma, Daddy, and your baby brother Kai. There was someone fairly famous here in town today. Not usually one for this sort of thing, I trekked out with the masses hoping to get an autograph, because honestly, he tops the list of people I would most like to meet. As I handed him my item to sign, I found myself getting choked up a little. Not because I shook hands with someone famous, but because I got to hand him a tiny NHL jersey and tell him I was getting it signed for my son. Man, it felt good to be able to say that. For some reason, when I think of Avery and Sophie, I never have pictured them as babies. In my mind, they have always been sturdy little toddlers – brown eyes, curly hair … running around getting into mischief. I don’t know why, but right from the start, this is the picture I have of them. I don’t know where the time has gone, but Kai is now all of these things. 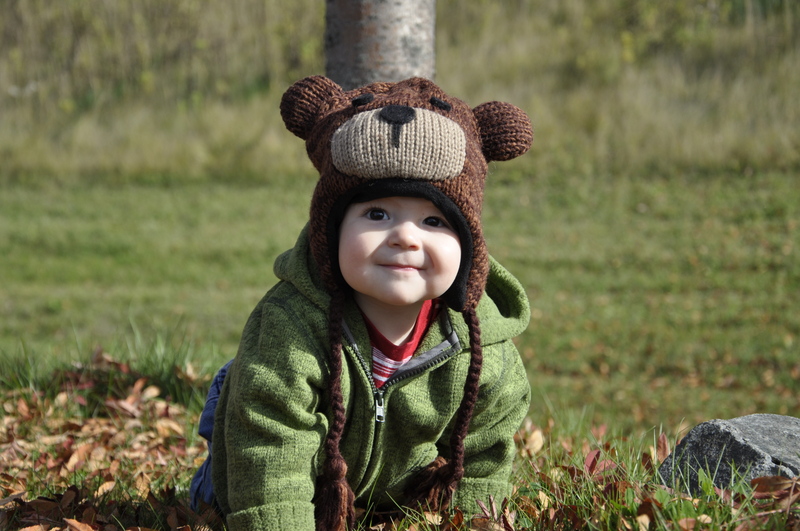 Somehow in the last months, his babyhood has slipped away … he is a full-blown toddler these days. Sturdy, with brown eyes and curly hair, he is into mischief all the time. It’s a bit bizarre that he brings to life the images I have in my head of them. It is so bittersweet. In many ways, I feel like I get to experience a little of what I lost … but it others, it brings to life exactly what all we will never have. It just reinforces the fact that grief never disappears … it simply morphs into different forms. On Friday, I spent a lot of time thinking about the twins. I thought about all those I know who have lost babes. I wished that none of us knew about the date. But I also spent a lot of time thinking about this little man. And squishing him, and playing with him, and listening to his little giggles … and invariable, forgetting to post what was on my mind. And I found it strange that even a year later I still struggle to figure out how these two parts of me work together – how they weave together to make me me. Some days I think I have it mastered pretty well. Others, like Friday, I realize that I probably never will. It’s hard for me to even look at those words. The emotions they bring up are unbelievable. DH was ready to begin trying again for another little one shortly after Kai’s birth. Me, not so much. I would love to have another child at home (if possible) BUT that involves trying again. And I am not feeling so ready for that. Thankfully it hasn’t been an issue so far. Kai is still breastfeeding and AF has yet to return. But as we slowly cut down his feeds (down to 1 a day now) I know her return is coming. So I am trying to sort through all the emotions … because really, trying again is just around the corner. Within months of losing Avery and Sophie, I knew I wanted to get a tattoo in their memory. With the very fragile state I was in however, I decided to put it off until I knew what, where … and knew both for quite a while. And finally, this fall – just shy of their third birthday – I was able to get it done. And it is absolutely perfect. On my inner ankle (somehow it felt the right mix of public/private/vulnerable/and not), I wanted something that was very much “them” without being blatantly babyloss. I wanted to allow myself to be able to avoid that conversation if needed – while not as common now, there are still times I just feel too fragile to talk about my girls without knowing what the reaction will be. 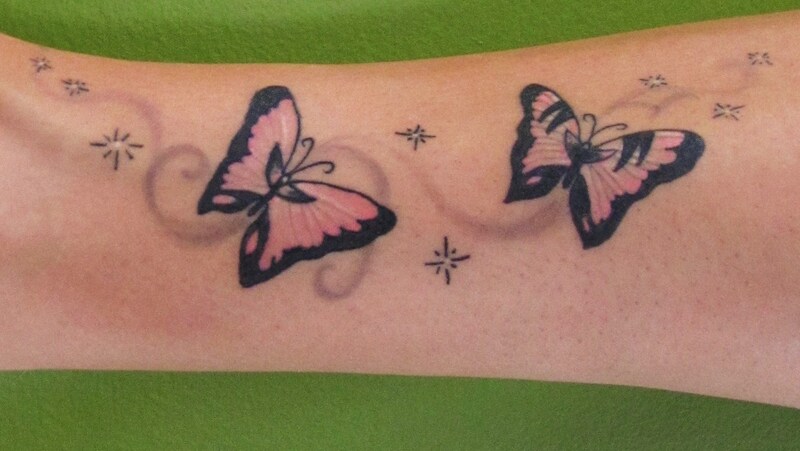 The butterflies, like for so many other baby loss mommas, remind me of my girls – they are each unique to represent the uniqueness of the girls, despite their identical genes. The swirl is what connects the two – showing that although two beings, they were intricately and completely connected. If you look close, the swirls include an “S” and an “A”, each associated with one butterfly. And I honestly can’t even express how “right” it feels to have it done. People have asked if I am shocked to see it there – and the answer is no. It just is right, the way it is supposed to be. My girls aren’t here, but they left a permanent mark on my life … it only feels right that there is a physical, tangible mark that represents that. And somehow, it feels like I now get to carry a little piece of them with me, wherever I go – as long as I am on this earth.